The Arts Advisory Council and the Wildman Studio proudly presents The Winter Salon: A Seasonal Gift Show with artworks by Willi Wildman and her studio participants. This is a fantastic opportunity to give unique & original artwork at affordable prices this holiday season. The two day opening event will be held on Saturday December 7th from 1 to 5 pm and Sunday, December 8th 1 to 4 pm. Musical entertainment and refreshments will be available. The show continues through the month of December and January. The artworks will be reasonably priced and will appear in many sizes including a large selection of mini-paintings. The works may be removed from the gallery wall and gift-wrapped on site at the time of purchase. Willi Wildman, Heather Adams, Kate Esplen, Susan Armstrong, Carolyn Corner, Nancy Daly, Ann Pearse Davidson, Pamella Branch, Michael Martin, Kay Sheppard, Ron Wren, Bobbie Fogel, Pat Patten, Heather Bakazias, Jo’anne, Scala, Aija Pavelson, Nan Helliwell, Liz Kimber, Barbara Hicks-Lyne, Bente, Shirley Stephenson, Molly Bartram, Shirlee Blatchford, Connie Key, Eunice Van Wert, Pat Turner, Barbara Hector, Joan Folinsbee, and more. The Wildman Studio is owned and operated by Willi Wildman in the town of Thornbury. For the last ten years Willi has welcomed artists and students to her home and studio to paint and share information, impart skills, and inspiration. The participants include “post-graduate” artists as well as inexperienced Sunday painters from all walks of life. The mix provides stimulation, some hilarity and often a wonderful explosion of talents and creativity. Wildman is a well-known artist in the community; large, powerful, and moody landscapes are her signature. Willi recently stepped down from the Blue Mountains Public Library Arts Advisory Council after ten years of organizing art exhibits at the beautiful library gallery. Before moving to Thornbury, Willi worked tirelessly with the BMFA (Blue Mountain Foundation of the Arts) Visual Arts Committee as well as Collingwood Library Gallery and was a founder of the Georgian Bay Arts and Crafts Association. Along with numerous juried show awards, Wildman was nominated in 1994 for The Chalmers Award for Creativity and Excellence in the Arts. 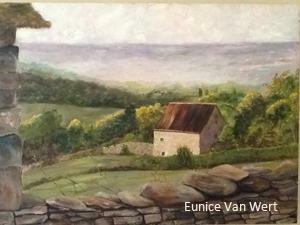 Wildman continues to engage the artistic community with her art classes and passionate paintings of our landscape.